A fuel cell powered by human blood has been created by researchers at the University of British Columbia in Vancouver, Canada. 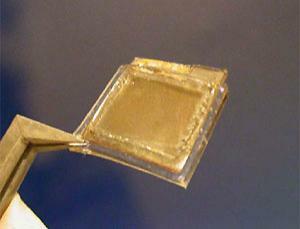 Yeast cells in this microfabricated polydimethylsiloxane (PDMS) microbial fuel cell (MFC) with embedded micropillar electrodes feed on the glucose in blood; the device may one day power electronics implanted in the body like pacemakers. This MFC is characterized by a flexible and biocompatible structure suitable for body implantation as a potential power source for implanted bioMEMS devices. The MFC is biocatalyzed by a microorganism, Saccharomyces cerevisiae, which converts chemical energy stored in glucose in the blood stream to electrical energy. The MFC is a laminate design... The coulombic efficiency of electron conversion from blood glucose was 14.7%. The fuel cell shown in the illustration produces about 40 nanowatts of power; if a capacitor were used, this might be enough power for some devices. Also, the yeast could be genetically engineered to boost its power output. This kind of power source is just the thing to provide energy for science-fictional inplants like the implanted microprocessor monitors from Neuromancer or maybe an implant watch like the one in Niven's Cloak of Anarchy. From New Scientist and A Microfabricated PDMS Microbial Fuel Cell (abstract).